This year adidas Originals welcomes you celebrate Originality in the neighbourhood. 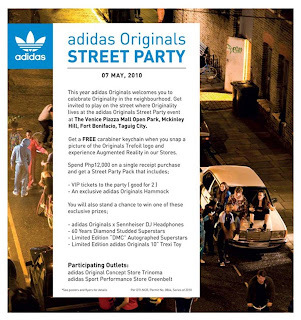 Get invited to play on the street where Originality lives at the adidas Originals Street Party event at The Venice Piazza Mall Open Park, Mckinley Hill, Fort Bonifacio, Taguig City. Get a FREE carabiner keychain when you snap a picture of the Originals Trefoil logo and experience Augmented Reality in our stores. Stand a chance to win party tickets and exclusive prizes.